Elliott finally returns, but he and Catherine are now different people. He’s a star high school athlete, and she spends all her free time working at her mother’s mysterious bed-and-breakfast. Catherine hasn’t forgiven Elliott for abandoning her, but he’s determined to win back her friendship… and her heart. To be honest, I have absolutely NO idea how to review All the Little Lights, as I'm going to do my best to avoid any and all spoilers and refuse to delve into book report territory. I went into reading the book blind, and I want everyone else to do so too. Was I hooked from the beginning? No. Why? Elliot is awesome – his child version was the sweetest, most protective little fella, but the setting and pacing were bizarre, and it never really changed from that point onward. There are three eras to the novel. Child versions of Elliot and Catherine, which is only a handful of pages. Fifteen-year-old kids, which spanned a portion of the novel. The main portion featured a seventeen and eighteen-year-old Catherine and Elliot, including scenes in a high school. What I truly appreciated within All the Little Lights is how the bond between Elliot and Catherine was instantaneous, but it wasn't romantic in nature. Real love must be based in friendship, not infatuation and lust. Over hundreds of pages, the pure connection between Elliot and Catherine is forged with organic, lifelike realism. I'm a sucker for what I call Gothic romance, featuring a mystery surrounding a drafty old house filled with secrets. I love the classics and their remakes into film, and this book does hold a place in my heart because it reminds me so much of those types of stories. Which is why the high school environment felt so out of place for me, like the two parts don't necessarily form a whole. I can't call this novel a page-turner, not with the baffling pacing and release of information. As I read, I could sense something beneath the surface. What was jarring is how it was Catherine keeping the secret, refusing to tell others what was happening, but the reader was literally INSIDE Catherine's head during her narration, which is what had me stuttering and stumbling as I read. There was a door slammed between our narrator and the reader, and it created an emotional disconnect, while she was telling us her story. The novel is definitely a mystery – a mystery the narrator is keeping from the readers and all the characters in the novel. While I love to be surprised, this slowed the pacing while simultaneously frustrating me. I was curious, but I could see some readers hanging up the towel because no information is given. There is no steady breadcrumb trail, no piecemeal delivery to keep the reader engaged. No trails for readers to follow as they connected the dots – no foreshadowing or information to be puzzled together to solve the mystery. The reader has to wait through 90% of the novel to be given... something. While reading everyday events, which did seem to feel redundant, slowing down the pacing even more while feeding my need to skim-read, there was this 'I'm in the Twilight Zone' sensation while reading about teenage angst, football games, and catty mean girls. The juxtaposition was jarring. Not only did it feel several hundred pages too long, it also read longer. So, Erica, why are you handing out five stars? Native American culture intrigues me, because I come from a region in the northeast that is heavily laced with Native American history. While there is a lot of racism shown, I don't feel as if it's the author's voice flowing through – more as if she is placing a voice to the ignorance that does infect through the generations. I will say, this felt more like what I would have heard when I was in fourth or fifth grade back in the early 90s, while I was second-hand bullied alongside a Native American boy in my class, not in a more politically correct 2018. True story, as we sat next to one another - (boy's first name) "Green swims in Lake Erie!" (nickname for Erica) was a euphemism we dealt with several times a day for two school years, along with other racial slurs. So this portion hit me hard, because the treatment of my classmate and his brother has never left me all these years later. I wanted to give Elliot the biggest hug and tell him he's an amazing person. I also say time and time again, if the author surprises me, I don't care what else I found off within the novel, I will hand out a 5-star rating, because it's nearly impossible to surprise me. I will admit, I did get it right early on, but I dismissed it as quickly as it popped into my head... hundreds of pages later, I was like, WOW! HA! Awesome! I adored Catherine and Elliot, even if I felt the connection was almost an unhealthy extreme, but it was the aloofness, the lack of emotion from Catherine as she kept her secrets, her codependency on her mother and Juniper that felt so off. While I was entertained and awed, while I appreciated the writing and the story itself, that disconnect between Catherine and the reader was most difficult for me. I'm glad I read the All the Little Lights, and I'll never forget it. However, reading is so subjective, I have no idea who to recommend this to – I did rec it to my own mother, though. Young Adult age-range: 13+, featuring kissing and violent situations. We follow Elliot and Catherine from when they first meet and spend a summer together, to them being separated, and Elliot’s return to Oak Creek in his senior year. When Elliot returns, two years have passed and there have been some big changes in Catherine’s life, but he is still completely devoted to her. If you decide to read All the Pretty Lights please be patient. It took me three days to read the first 40% of the book and it felt like three weeks. A lot happens in Elliot and Catherine’s lives but at the same time I felt like there was not much direction and I was wondering where the story was going. I also had a feeling of dread at what was to come next because it felt like it would be something big. Elliot’s love for and commitment to Catherine, coupled with my curiosity about what was actually going on at the Juniper, kept me reading. All the Pretty Lights deals with lots of different issues. Family drama, teenage love, loss, bullying, and high school drama, as well as having mystery tinted with danger. Once the story really got going about half way through I couldn’t put it down. I was on the edge of my seat as it unfolded in ways I was not expecting. Every girl deserves to have a guy like Elliot in their life and in their corner, and he is a big part of what makes All the Pretty Lights an excellent young adult novel. This story is well worth your time. My advice is don’t rush it, be patient, and just let the story unfold. 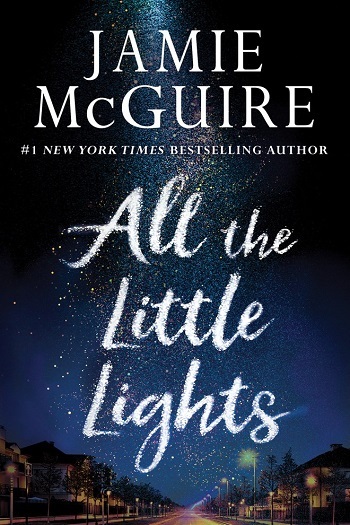 This was my first time reading anything by Jamie McGuire and I have to say that I was completely blown away by All the Little Lights. I just have no words to describe my current feelings after such an ending because I am still reeling from it! All the Little Lights was definitely kind of a slow start for me, but by the end I was on the edge my seat and completely invested in Catherine and Elliot’s love story. I also really appreciated that the story rotated between Elliot’s point of view and Catherine’s. Although, I thought this was gonna be a nice, sweet young adult story about first love and coming of age, but what I got was actually a riveting tale with a gothic feel to it. If this is what I can expect from all of McGuire’s books I may have to start adding them to my TBR pile immediately because by the end, I could not put it down. I’m not gonna lie, I probably was leaning more towards a four star review, but by the end I was just so incredibly impressed that I can’t not give it a full five stars. Like, is it just me? I literally can’t stop talking about it. I am so enchanted that I want to immediately read it again! Don’t be fooled by the cute little synopsis and charming little cover picture because this story has depth! I think fans of Jennifer L Armentrout's Don't Look Back and Sara Shepard’s Pretty Little Liars series will easily find themselves intrigued by this book. Oooh – this is a wonderfully creepy story full of Southern Gothic charm. On one level, it is the story of the friendship between the daughter of a wealthy family and the son of a blue collar aboriginal family. It is a dark coming of age story and the story of a childhood friendship that gradually becomes a romance. On another level – Nope. Not going there because revealing anything else might spoil the story for another reader. There is a little bit of Harper Lee’s Maycomb in this book and a whole lot of Flannery O’Connor’s twisted imagination, but the story isn’t crafted quite as tightly as the classics by either of these writers. The pace is slow, and the time lapses and shifts in narrative voice don’t always work. Too many characters on the periphery of the story aren’t fully fleshed. It took time for me to get into the book, but I really enjoyed the stifling atmosphere and the gradual build of tension. I wasn’t expecting to love this book. The young adult blurb and John Green style cover doesn’t really do it justice. But Elliott and Catherine captured my heart and my imagination. Once I got properly stuck into their story, I couldn’t put it down and I couldn’t get it out of my head once I finished it. I have to recommend it both to teens and to adult readers because – like all the best books – it doesn’t fit neatly into easy genre boxes. 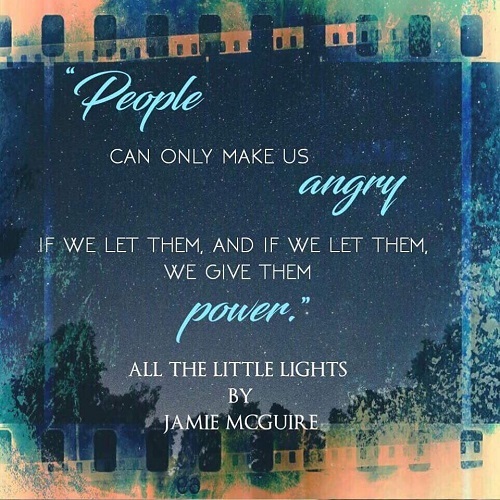 Reviewers on the Wicked Reads Review Team were provided a free copy of All the Little Lights by Jamie McGuire to read and review.